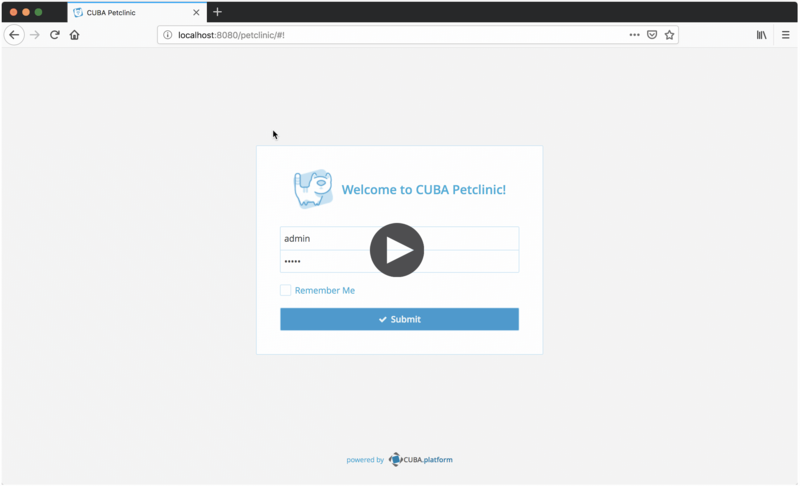 This guide walks you through the CUBA APIs for programmatically interacting with the database through the DataManager API. Oftentimes it is necessary to interact with the database in a programmatic manner. In a CUBA based application, these cases are not as omnipresent as in other frameworks due to its declarative nature of data-binding for UIs, but still, there are a lot of cases where data has to be loaded from the database or stored in the database as part of a business process. The main interaction point that CUBA provides is the DataManager API. This API allows the developer of a CUBA application to load and store data in the database through the general abstraction of entities. DataManager is an Abstraction on top of the Java Persistence API (JPA). It hides away certain details that are not required on a day-to-day basis. It also adds certain capabilities that are not available out-of-the-box in JPA. Those capabilities are mainly the Views concept as well as the application of security constraints. More information about differences between JPA and DataManager can be found in the docs on DataManager vs. EntityManager. 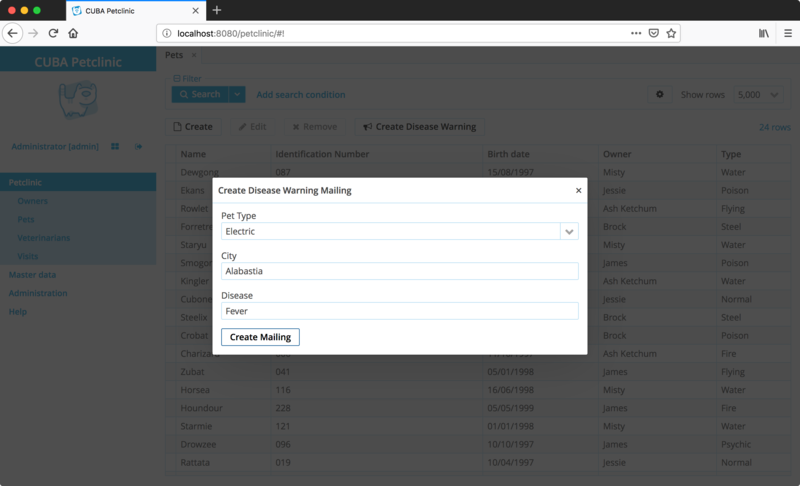 DataManager has multiple ways to load data from the database. In this guide, the two main options are covered: load a single item as well as multiple items based on Queries. The first option is to load a single Entity instance from the database. This option is often required if reference data needs to be read from the database in order to execute some logic for that entity instance or with the help of that entity instance. 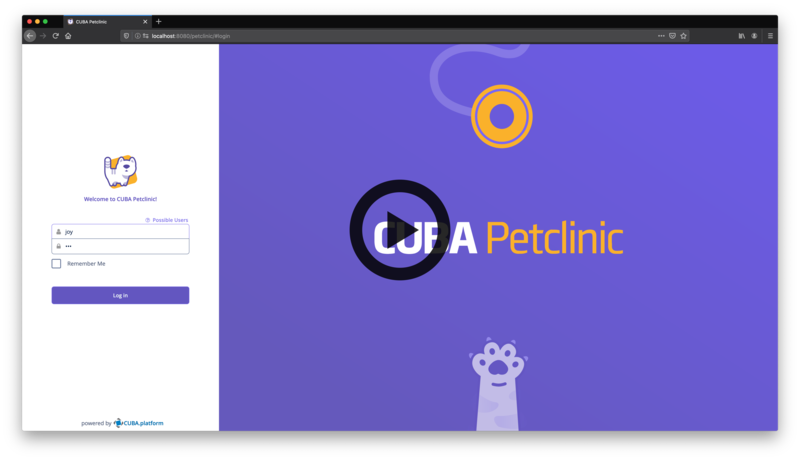 In the case of the Petclinic example, there is some business logic which should create a new Visit for a given Pet by its Identification Number. DataManager has a fluent API which allows to chain operations on the load operation in order to define parameters to the execution. In this case, the interaction starts with dataManager.load(Pet.class). Then the JPQL query is defined and the associated parameters are configured with the parameter values. The one() method executes the load operation and fetches exactly one item that matches the criteria. If there are no results the corresponding exception is thrown. It is up to the application developer to decide if the query can return one or possibly multiple results. In this case, it is only possible to create an Identification Number once, we can be sure that the query will return at the most one item. In this case, the attribute identificationNumber is not the primary key of the entity. But it represents a globally unique identification number given by proper Pet authorities - therefore it is modeled uniquely within the application. The next very common option is to load multiple items defined by a query. The Petclinic application has the capability to let the user send out Disease Warning Mailings. The user has to define the location of a known disease as well as the type of Pet that is endangered by this disease. The system will find all endangered Pets and send out a Mailing to the owners. The query part is a little more complicated compared to above, but the same pattern applies. The differences in this example are the usage of the list() method as we expect multiple Pets from the database query. 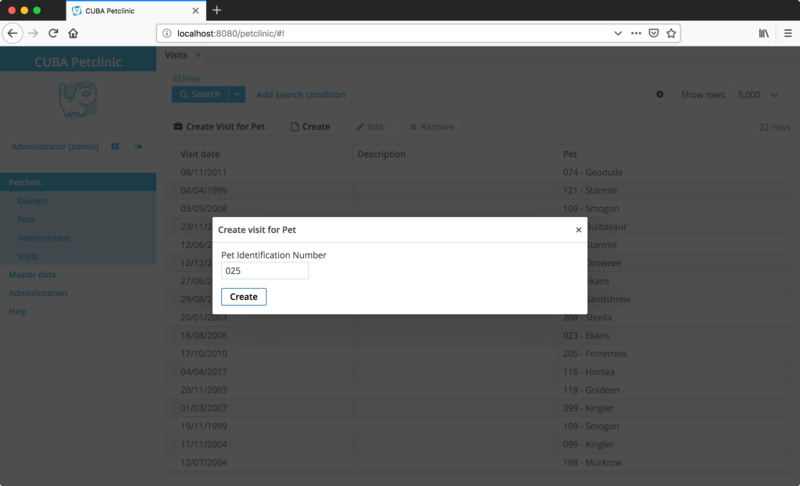 Also, a specific view has been used, because not only the Pet data but also the Owner data has to be loaded in order to send out the Mailings. DataManager is also responsible for writing data into the database. There are also different ways to achieve it based on the case at hand. The first most commonly used case is to update or create a single item in the database. There are no major differences between creating and updating an entity from the usage perspective. The creation of an instance through DataManager does the initialization of the instance as well. It is important not to create an instance via new Visit() but rather through this Factory method, so that CUBA can do all the required initialization (like @PostConstruct annotated methods e.g.). Once the entity instance was created, the data of that entity has to be set through its corresponding setter methods. In this case, the database instance of the Pet is set as well as the current date as the visit date. The process of storing an entity instance contains a few steps like security checks, execution of Entity Listeners and so on. The return value of the commit method is the stored instance with all the properties set that have been added during the storage phase. There is a couple of other convenience API methods for storing entites. For more information about those variants see the DataManager API reference. The example from above shows how to store a single item in the database. Although this is oftentimes sufficient, a lot of cases require to store multiple items in a single transaction. The default example for this is the bank transfer from one account to another. In this case, it is crucial that the update of both accounts happens together or not at all, but never only one of them. The DataManager API always encapsulates the database operation in a transaction. This means that by default the commit(visit) call is executed in one transaction. Another call to commit would create another transaction. To execute updates on multiple entity instances there is the concept of a CommitContext. The commit context defines all entity instances that should get created / updated and removed. The DataManager accepts a CommitContext object as an alternative to an entity instance. In this case, all entity instances that are held by the commit context will get transferred to the database within one transaction. The CommitContext has two main methods: addInstanceToCommit as well as addInstancesToRemove which allow defining which items should be added / updated as well as removed within one transaction. Sometimes the fact that DataManager API always creates a new transaction is not the desired behavior. Instead, an already running transaction should be re-used. In this case, a very similar API called TransactionalDataManager can be used. It behaves basically the same as the regular DataManager with the difference that it allows to join an existing transaction as well as enabling programmatic transaction handling. The Data Manager API is a CUBA abstraction that allows an application developer to fulfill common use-cases for working with databases. It has multiple operations to allow for regular create, read, update and delete operations (CRUD). Entity instances can be stored directly or within a Commit Context. Every operation will be encapsulated in a new transaction.